Anyway, one of the biggest enablers of our podcast habit, Earwolf Media—home to Comedy Bang! 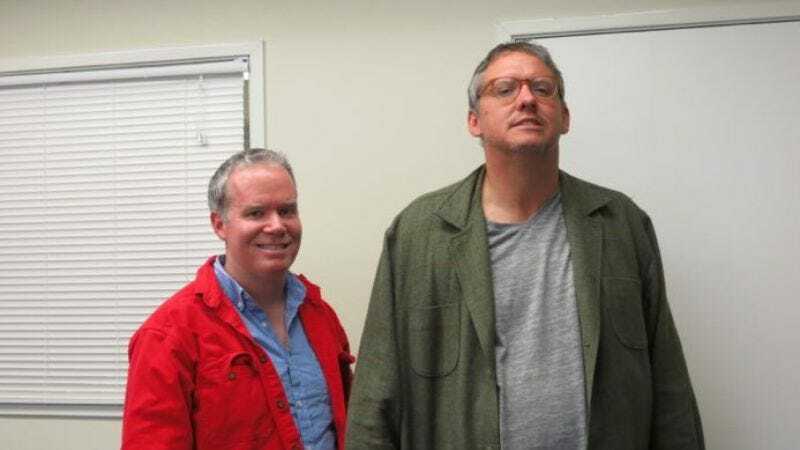 Bang!, Who Charted?, Professor Blastoff, and more—keeps us hooked on its pod-skag this week by unveiling Owen & TJ Read The News, a new monthly podcast featuring writer-director Adam McKay (the man behind Anchorman, Step Brothers, and Talladega Nights) and FOD’s Owen Burke. And A.V. Club readers are getting an exclusive first listen to the debut episode. The conceit: McKay plays TJ, a salesman of cell-phone cases (and wannabe rapper) from Jacksonville, Florida. He and Burke discuss the important news of the month, though TJ’s world doesn’t extend much beyond his hometown mall and local Hooters. Just like real Floridians! Check out the first episode via Earwolf or iTunes. New episodes will be released monthly. In the meantime, Earwolf, what’s the ETA on that Marissa Wompler Christmas special? Womp it up!